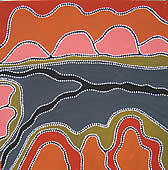 Waringarri Aboriginal Arts is situated at Kununurra in the heart of the east Kimberley region of northern Australia. The art centre was established in 1985 and officially opened as an art and craft outlet in August 1988. Since it has served to foster and promote the work of Aboriginal artists from several language groups in the North East Kimberley including Mirrawoong, Gajerriwoong, Ngariman, Jaminjung, Ngaliwuru, Murrinh-patha, Wunambul, Kija and Kjaru primarily through their links to Mirrawoong country and families by marriage, trade routes and geographical proximity. Waringarri Aboriginal Arts is the first wholly aboriginal owned art centre established in the east Kimberley region. Many famous artists have emerged through Waringarri including Queenie McKenzie, Rover Thomas and Paddy Carlton presenting an aesthetic that is significantly an east Kimberley style. While Waringarri paintings have a powerful and abstract contemporary aesthetic the importance of each individual’s knowledge of the land and its stories remains paramount. An artist will repeat images of traditional country telling and retelling the stories and landmarks inherent in the “landscape”. 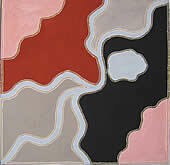 Painting primarily with ochres and pigments Waringarri artists make further comment on the important aspect of maintaining links to the land and traditional aboriginal culture.